This is the 11th successful consecutive week of my ongoing series Cooking with Family-Family Food Friday and if you have missed any of the previous posts in this series,check them here. This week's entry is sent to me by my S-I-L 'Ashwini' and I assume you all know her well by now as she had already sent 2 posts earlier.As my series is loaded with lots of rice flour dishes I asked my S-I-L to send something different and I was happy to receive this one more favorite breakfast item of mine.Gunta Ponganalu is one of my favorite breakfast item and love to eat it anytime.I am sure all of you all are aware of this tasty item and is called as 'paniyaram', 'paddu','guliappa' in other languages,I have already blogged a version here and the difference here about this recipe is it is made out of poha and curds which in turn makes gunta ponganalu very plump and they also have crispy crust outside and soft and spongy inside.Few makes gunta ponganalu with left over idli/dosa batter as it is easy to make but making a batter specially for this is really worth the effort you have put in order to eat tasty,crispy,plump and spongy gunta ponganalu. Let us see what Ashwini wants to say about this. 'As a child I never used to like this item and hence I used to ask my mom to pack my breakfast so that I would share it or rather give my full box to my friends as they all enjoy eating it. But growing up,I had to eat these Gunta Ponganalu without any lame reasons and I used to eat it as though I was punished. But one day when my mom made it, she said she is sorry for not making another breakfast item for me,I thought I have changed and I ate.When I had my first bite I just jumped up with joy and told my mom that its too good and also asked her to teach me how to make them.She was shocked when I told that and she happily taught me.Things change along with us,the ones which I used to hate as a kid made me to change my mind once I grew up and I am sure many of us would have experienced this.I was more keen to learn this as hubby loves Gunta Ponganalu and when I made it for him for the first time he thoroughly enjoyed it to the core. Soak the rice for 4-5 hrs. Soak poha in enough water for 1/2 hr. Grind soaked rice in wet grinder until almost done. Add poha, curds and salt and grind into very smooth paste. Remove it and let it ferment for 16 - 18 hours. (Don't add more water while grinding,add about 1/2 cup water while grinding).This requires longer fermentation period,so do not skip this part of fermenting for longer hours.If you start grinding the batter some time around 12'o clock in the noon you can make this for breakfast on the next day.So plan it ahead of time. Add finely chopped onions, sweet corn, green chilli paste,chopped coriander to it and mix well. Add cooking soda with a tsp of water in a ladle and mix in the water and mix properly. Heat the gunta ponganalu(aebleskiver) pan and add 1/4-1/2tsp of oil in it. When it is hot enough pour the batter using a spoon until it covers 3/4 th gunta(impression) and cover it with a lid. Let it roast on medium flame until golden brown in color. After a couple of minutes using a fork or sharp knife run around the edges of each ponganalu and turn to the other side and roast until golden brown.Repeat the same process to make other rounds of gunta ponganalu. 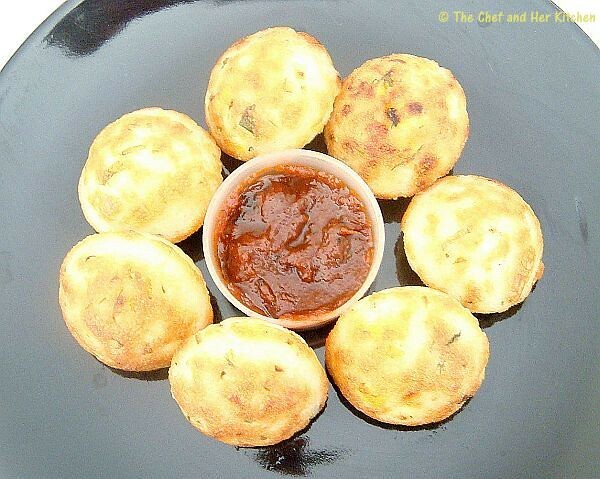 Serve crispy hot gunta ponganalu with onion chutney or red coconut chutney or ginger thokku. 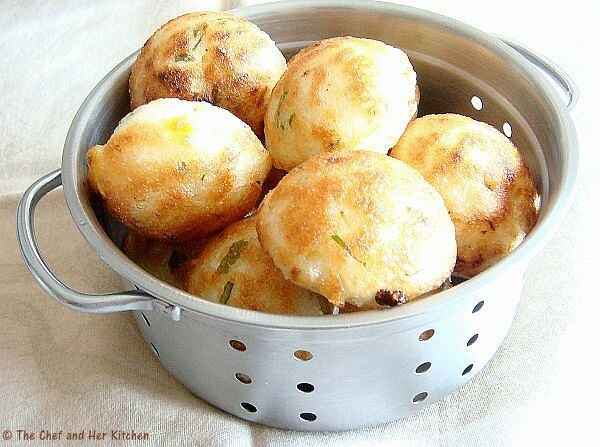 You can also make Gunta Ponganalu with left over dosa or Idli batter but it wont be as crispy as these. If your batter is too thin then you will not get crispy Gunta Ponganalu, so just add little rice flour, mix it well and use the batter after 3 - 4 hours. Fermentation for longer period,a minimum of 16 hrs is mandatory otherwise these will not be sour enough which they are meant to be. 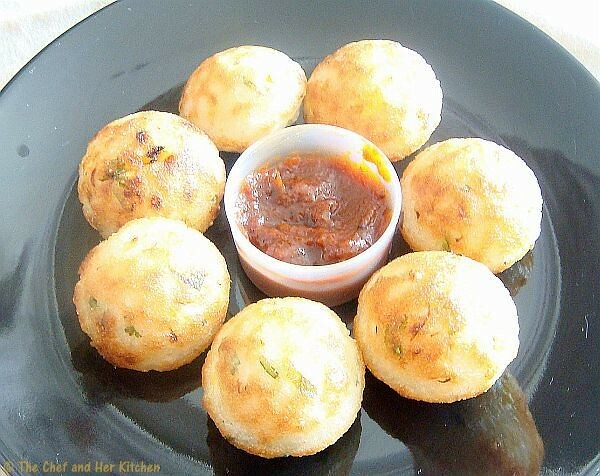 If your gunta ponganalu does no plump up like how it is shown in photographs,do no panic just add 1/4 tsp cooking soda mixed with water and mix the batter well and start making. Curds should be sour for this,ideally you can use 3-4 days old curd or keep the fresh curd outside for 8-9 hrs before using it. The batter would be really thick and there would not be much increase in volume as we are not using urad dal in it,so do not panic just ferment the batter for longer time and start making gunta ponganalu. You can even add grated carrot, finely chopped spring onions, soaked chana dal as a variation. very tempting recipe.. looks awesome. 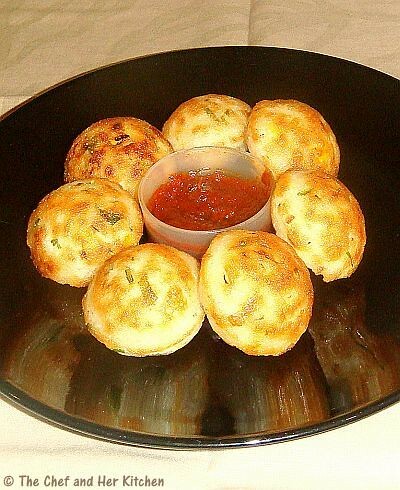 This is a slightly different ponganalu recipe ..they look so tempting...will try it out. tempting recipe and love this neat shape. inviting platter. Looks Yummy!! and Delicious...and low fat as well. Lovely ball with tangy chutney. Perfect snacks in rainy day at evening. Oh My. It looks so scrumptious. interesting n healthy snacks....nice click! I think ur SIL should start her own blog :) Nice recipe and the last click is too good,nice click! Wonderful recipe,they luks so perfect...lovely clicks. Excellent and very interesting recipe !! they look cute and perfectly done !! loved them !! never tried this one..looks delicious. 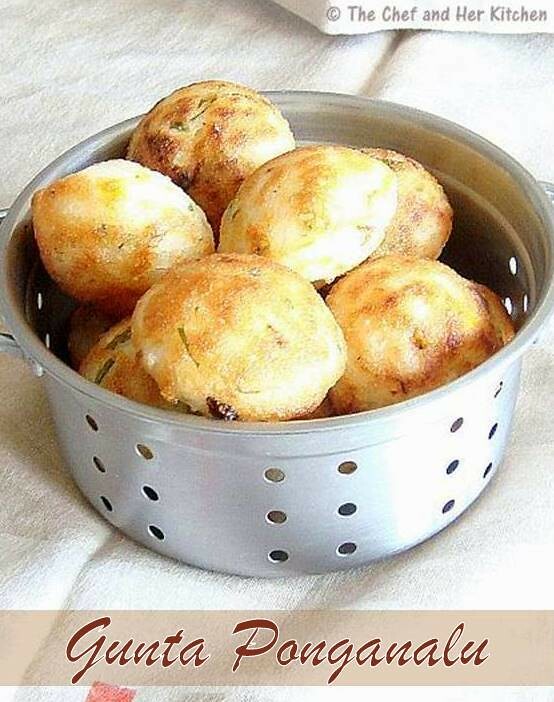 Delicious nice recipe, I love to try them. Would love to taste it. Looks so tempting Pratibha! Pongalams look yummy .. love the pictures. Lovely recipe and they look very nice. Delicious gunta ponganalu,looks so crispy and yummy. É tudo de bom mesmo!!! they looks very crispy and perfectly done!!! Looks tempting, delicious and perfect. I have never tried with poha..
Beautiful vessel and presentation.. my favorite breakfast..
@prarthu, For this we use coarsely ground green chilly which is added for the spicyness,it does not change the color of these ponganalu.You can even add finely chopped green chillies but would be very spicy when you bite into it and ground chilly paste is a better option.